I did a blog post a long time ago about D&D Fantasy Miniatures – In Origami! It was pretty popular and I was asked for instructions on how to make an Origami Dragon. Well ask and yee shall receive – eventually! I’ve put together a playlist of video tutorials for Origami Dragons all by jonakashima and tadashimori. I’ve put them in order of length, so the first one is the shortest and simplest to make (6 minutes) and the last one is the longest and most complicated (about 2 hours). So the tutorials go from Beginner to Advanced, and you can pick which you want to do based on your level of skill – or work through them all! 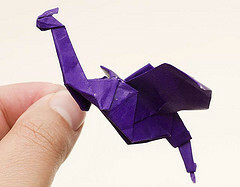 The Origami Dragon Tutorials are embedded below or you can click here to view the playlist. Also, here are a couple of simple origami dragon diagrams both based on a bird base, one standing, one in flight. I hope this is useful and you’ll soon be making an army of fire-breathing monsters out of paper. Only don’t actually make them breath fire as it’s incredibly bad for their health! Oh and if you do make any of these I would so LOVE to see your pics!